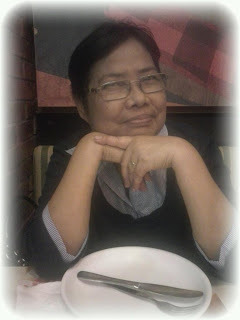 Happy birthday my Dear Nanay... :) We may have a lot of differences but that won't change the mother-daughter bond that we have. You're always gonna be the voice inside my head. Although sometimes that voice becomes irritating (LOL!) but it's okay. I know you just worry about your stubborn daughter and always want the best for me. Someday I'll make you proud of me! I love u and I miss u... mwaahhh! Yesterday was my Mother's birthday. She just turned 67 years old. I somehow dread this day. Not I'm not happy about my Mom ageing gracefully. I just worry about her not eligible for my company's health card anymore. She's my only dependent and the health card was really a great help to us. Anyway, I didn't tell her about it because I know that she's just gonna get worried. I was trying to be positive when I called her up and spoke to her over the phone early yesterday. I greeted her a Happy Birthday! And asked what she was planning to do for the day. I was expecting she's going to unwind and spend time with my brother and her grandson Brandon and maybe go to the beach. But I was wrong. What she had in mind was go to the court and file a complaint against one of our neighbors in GenSan. Seriously? That's her eccentric way of celebrating her birthday. Sigh. What an exciting thing to do on your birthday, Mom. And guess what? No matter how I persuade her to do something positive and spend a non-stressful birthday, my brother told me that she still went to GenSan and did what she had in mind.